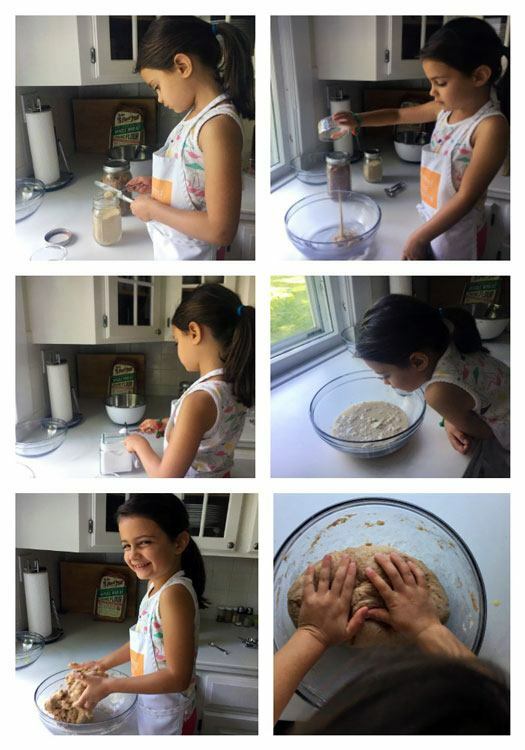 While there are tons of great recipes I like to make with kids, I love to make whole wheat pizza dough because it is very hands-on and engaging for kids of various ages. Toddlers and little kids can marvel the changes they see when wet ingredients combine with dry while older kids are equally fascinated by the way the yeast grows and bubbles when combined with sugar and warm water. Anyway, over the last six years of cooking with my daughter, I’ve learned the hard way to always be prepared when she joins me in the kitchen. So here are some tips to keep in mind when cooking with kids. First, recipes will take longer to prepare when kids are involved. While cooking together, you’ll be exploring ingredients and tools to be used, stopping frequently to show them what to do or how to do it, checking their work, keeping hands away from mouths or noses and washing hands that have been in mouths or noses and likely cleaning up the inevitable spills that will occur. Second, you should keep extra ingredients on hand because you never know what will get dropped, spilled or tasted along the way. Third, your little chef might lose stamina in the middle of a recipe so you will probably be finishing his or her work. While this list may seem daunting, it’s worth it to see the expressions of wonder, confidence and joy on their little faces when they see and taste what they have helped create. It isn’t essential, but I recommend using a kitchen thermometer like a meat/poultry thermometer or candy thermometer to ensure that your water is within the range of 95-110°F. Your yeast will be happier that way. Also, keep a few extra tablespoons of flour handy. Depending on the flour and the ambient temperature, you may need to add additional flour, one tablespoon at a time, to get the desired consistency and texture for your dough. For this particular recipe, we were generously supplied with ingredients to use by Bob’s Red Mill. (Thanks, guys!) While we always love a simple Margherita Pizza in my home, if you’re looking for some pizza-topping ideas check out these recipes. Our family favorite is the Lemony Kale Pizza. Yum! 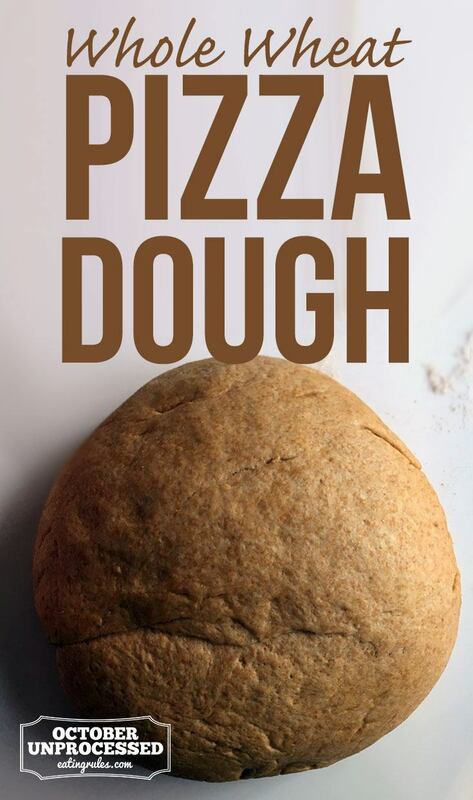 So without further ado, here’s our recipe for Whole Wheat Pizza Dough. Happy Cooking with Kids! 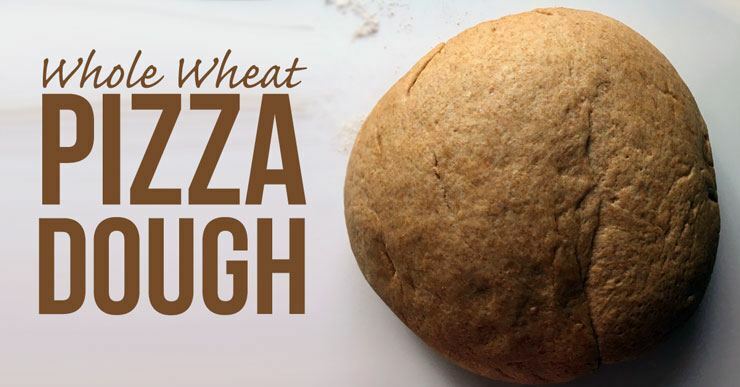 Whole Wheat Pizza Dough is a great way to introduce kids to cooking, while creating a healthier version of a family staple. Pour the warmed water into one of the glass bowls. Add both the yeast and the sugar to the water, gently mix and let sit for 10-15 minutes until the yeast bubbles. Add in the garlic powder, salt and olive oil and gently mix again. Slowly stir in the flour and then mix it all together with your hands. Mix or knead the dough until it is elastic and smooth. This takes about 10-12 minutes. If it feels sticky as you’re working, add a little more flour, one tablespoon at a time. To determine if the dough is ready, tear off a small chunk and gently stretch it apart. If it becomes translucent as you stretch it out, it is ready. If it breaks before becoming translucent, knead it for a little bit longer. Once it’s ready, place the dough into a glass bowl that has been lightly brushed with olive oil and cover it with plastic wrap. Leave it on your kitchen counter until it doubles in size. This usually takes 1-1½ hours. The warmer it is in your kitchen the faster your dough will rise. After the dough has doubled, turn it out onto your lightly floured counter. Knead it for about a minute to release any air pockets. I like to roll it around in large circles too in order to give it a rounded shape. Let the dough rest for 10-15 minutes under a damp kitchen towel. Now it’s ready to cook! If you use a different brand of yeast, you’ll need 1 tablespoon or ½ ounce of dry active yeast. In the spices section of my local grocery store, I found organic garlic flakes in a little mill so we ground up the garlic for the recipe. I like to bake my pizza on a pizza stone. If you don’t have a pizza stone, you can use a baking sheet sprinkled with a little semolina flour or lightly brushed with a high-heat oil. I leave the pizza stone in the oven while it heats up to 425°F and let it warm for an additional 30-45 minutes if I have time. You do not have to do this with a baking sheet. Before I top the pizza dough, I typically par-bake it by baking it for two minutes, removing it from the oven and then flipping over the dough so the topping side gets a little cooked before I top it. Then I add my chosen toppings, put it back into the oven and bake for an additional 10-15 minutes.